The app will allow spectators to track up to ten runners in the race, and select for which checkpoints (10K, Half, 30K, Finish) they would like real-time updates of these runners. Spectators will also be able to search for runners by bib number or by name, view a real-time race leaderboard, and search for results after the race. The app allows runners to easily view key race information, tour the race course via Maps, and easily share their race experience on social media before or after the race. Pay your bills anywhere, easily using your mobile device! This mobile application is exclusively for use by consumers wishing to pay Bill2Pay clients. Bill2Pay provides secure payment channels for many clients across varied businesses. These include Utilities, Cable, Insurance, and Education providers. If you arrived here from a link provided by the company you wish to pay, you will find them available in the app. Downloading the Bill2Pay app here allows you add from a listing of available clients within the app. Bill2Pay is a Level 1 PCI Compliant payment processor, the highest security rating in the electronic payments industry. Put the Rig in Your Pocket(TM) with a Mobile Application. This powerful new mobile app lets you check the status of all of your wells with our service from the palm of your hand. View Real-Time Streaming Data and sort all of your wells with our service by proximity to your location. Now it‘s easier than ever to see the most up-to-date, near real-time well log at your fingertips! The HealthCare Nutrition Product Guide App provides healthcare professionals with a comprehensive overview of the nutrition products that are offered, including ingredients, product features and complete nutrient profiles. This Product Guide can be searched by medical condition, brand or product category to make it easy for healthcare professionals to select the products that are most applicable to their patients' needs. The Formula Guide App provides healthcare professionals with a comprehensive overview of a Family of Formulas. This infant nutrition guide includes product ingredients, nutrition profiles, mixing instructions, calorie modifications, and more! Whether in the office, at home or on-the-go, healthcare professionals will now have around-the-clock access to this valuable formula guide resource. When you need a rapid deployment of a customer facing directory so potential customers could quickly find agents, office locations, and other services on their iPhone and Android devices, look not further. Leveraging HTML5 technologies, CTI was able to rapidly deploy hybrid applications to the iTunes Store and Google Marketplace. With the Holiday season fast approaching, Coldwater Creek needed a mCommerce site that could run as a hybrid application on the iOS platform to promote speciifc looks for purchase. CTI was able to deliver and meet the deadline. By incorporating 'Blood Sugar Stabilization' techniques, users can create and follow diets based upon their own Body Mass Index (BMI). By using personal information, every users experience is custom tailored to their exact body types. 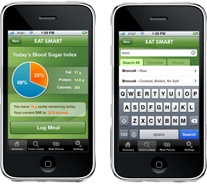 Eat Smart can also locate the nearest location to find the best ingredients to use in your meal plan, and what to order in case you happen to eat out. It's like having a nutritionist in your pocket! CallSource's customers needed instantaneous real time data feeds for leads, sales, and pertinent inquiries sent to mobile devices. CTI's custom solutions provided this ability. CMS and other call statistics that make up the metrics of a successful marketing campaign were delivered to all team members so advertising dollars and plans could be changed as the expectations were adjusted in near real time. Recorded calls were instantly compressed and send to the mobile device for accurate qualification of dispositions. Using SMS broadcast delivery methods, CTI allowed T-Mobile to recieve real time updates of marketing campaigns for thier crucial product launches and customer loayalty programs. The new "Chef Marc" app allows you to create the best and most healthy meals the Chef Marc way. With a webkit based framework, the app can be redressed for any occasion. Watch the video below for a Holiday demonstration.